Ministry of Finance and EPFO have been on overdrive to ease partial withdrawal rules from EPF. With “Housing for All by 2022” in mind, there has been significant relaxation in EPF partial withdrawal rules if you want to withdraw to acquire a house. In a press release dated February 21, 2017, EPFO introduced single page composite claim and all types of claim were merged into a single form. Moreover, onerous documentation requirement was replaced with a simple self-certification. You need to use the same form for partial withdrawal too. There are two Composite Claim forms. Single page Composite Form (Non-Aadhaar): For those who haven’t linked Aadhaar to UAN. An EPF member is required to submit only a self-declaration along with Composite claim for Aadhaar holders. However, if you haven’t linked your Aadhaar card with your EPF account (UAN), you need to get the form (Non-Aadhaar) attested by the employer. In this post, I will limit discussion to home loan repayment. No document is required in respect of such partial withdrawals. Self-certification is enough. When you withdraw for purchase (construction/addition/alteration/ repayment) of house, you need not submit any declaration or the utilization certificate. Clearly, the EPFO trusts you with your money. However, there is a provision that if the money is not utilized for the mentioned purpose, you will have to refund the entire amount along with penal interest. As I understand, the cheque will not be made to you (EPF member) but the lender, builder or agency. You should have completed three years of service. You can withdraw up to 90% of the accumulated corpus for purchase of house or house site. You can avail this partial withdrawal facility only once in your life for housing purposes. If you want to withdraw from EPF for repayment of housing loan, you must have completed 10 years of service. The maximum withdrawal amount is capped at lower of a) 36 months of basic salary & Dearness Allowance (DA) and b) Outstanding loan amount. There are many sub-conditions for EPF withdrawals for house purchase and repayment of home loan, which is not possible to cover in a single post. Please refer to Additional Read section or the EPF scheme for greater details. Now, this is interesting. The intent is to provide access to home loan where your loan repayment ability may be limited (not considering EPF contributions). Therefore, in addition to partial withdrawal up to 90% of the corpus for purchase of house, you can also pay your EMIs from EPF balance. With the provision that the amount from the EPF corpus will be debited and credited to the home loan amount, the banks may consider you for higher loan eligibility. For this purpose, banks may ask you to furnish your EPF balance and monthly contributions to them. For this, you can seek certificate from EPF (Refer to Gazette Notification in the Additional Read section for the forms). Alternatively, members can take printout of their passbook from website for submission to lenders. You can give an instruction to EPFO to pay a fixed amount every month to your loan account. You have to fill up a form and get it attested by manager of the bank branch where you took the loan and submit to EPFO. This may lower your EMI burden and may even expedite your loan repayment. You can avail this only so long as you are a member of EPF. And yes, there should be sufficient balance in your EPF account. This facility can be used if your cash flows are a bit tight. You can also use this feature for regular prepayment. However, I am not sure if that is a good idea. This is discussed in a later section. 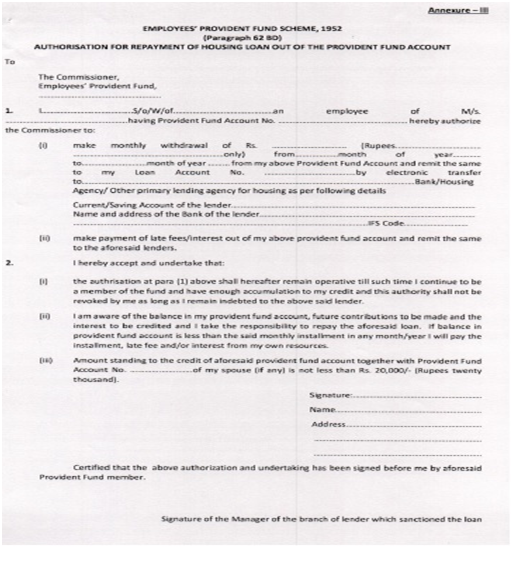 Do note withdrawal from EPF account is taxable if you have not made contributions for 5 years to your EPF account. Contribution through previous employer is also counted for the calculation of 5 years. Moreover for such cases, TDS will be deducted at 10% if the withdrawal amount exceeds Rs 50,000 and the PAN has been submitted. If the PAN is not submitted, TDS will be deducted at 34.608%. If you are eligible for Form 15G/15H, you can submit such Forms along with the Composite Claim forms. If you have been contributing for more than 5 years, there is no tax on partial withdrawals from PPF account. Should You Dip into Your EPF Corpus for Home Loan Repayment? I can easily see a few scenarios where such relaxation in EPF rules can be useful for home loan borrowers or prospective buyers. In case of loss of job, you can use the funds to repay loan. If you are struggling to pay home loan EMIs for any reason, using funds to prepay (completely or partly) may be useful. It is better than defaulting on loan EMIs, pay penal charges and see your credit score sink. As mentioned earlier, your loan eligibility may go up too. However, there is no need to use the facility for the sake of it. Why? You earn post-tax return of 8.65% on your EPF corpus. Your home loan costs you say 8.5% p.a. Post-tax cost of home loan can be much lower say 7% p.a. after taking tax benefits into account. Clearly, it does not make much sense for you to sell investment that earns you 8.65% p.a. and use it to repay loan that costs you 7% p.a. You need to work out effective cost of your home loan. It will depend on your tax slab and the quantum of tax benefits you can avail for loan repayment. That will depend on whether you make other investments/expenses eligible for deduction under Section 80C. For instance, contribution to EPF is an eligible deduction. Life insurance premium, PPF, ELSS are among the most popular. If your investments in such products eat up your Section 80C limit of Rs 1.5 lacs per financial year, there is no benefit that you get for principal repayment. Tax benefit for interest payment for a self-occupied property is capped at Rs 2 lacs per annum. Moreover, EPF interest is not fixed. It can change every year. However, since EPF subscribers enjoy a lot of political patronage, you can expect to get a good treatment. You need to do a bit of maths to figure out if using EPF corpus to repay home loan makes sense. It is never that simple. How to Link your Aadhaar Card to EPF Account (UAN) and ease withdrawals? How to use EPF kitty for your medical expenses?